A Series of articles gathering information from around the world and from a diverse range of sources to give a complete a picture as possible of how the modern climbing wall came about. We'll try to document the development of climbing walls a long side the development of rock climbing itself from the Victorian era to the present day. From Bildering and bouldering through the first incarnations of purpose built climbing structures, indoor and out with roped climbing to modern structures including articulated leading walls and today's demanding sport climbing, with the history of the humble bolt on climbing hold and the simplest bolt on hold traversing walls. 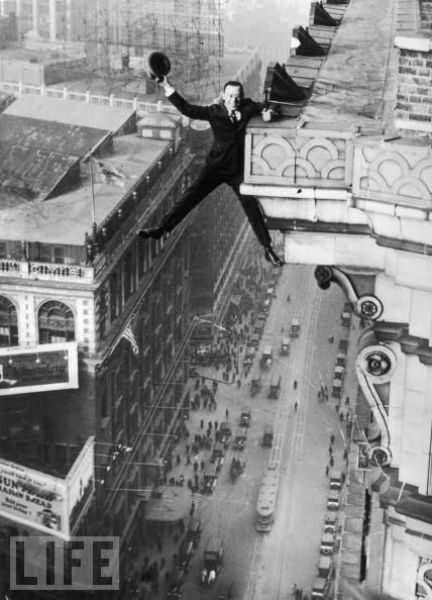 By the way that's Harry Gardiner hanging from the 24th story of the Hotel McAlpin in New York in 1923.Gardiner was better known as the Human Fly, was an American man famous for climbing buildings. He began climbing in 1905, and successfully climbed over 700 buildings in Europe and North America. Let us get something right from the very beginning - Don Robinson did not invent or build the first climbing wall. And neither did Colin Mortlock. Oh and Entreprise didn't invent the bolt on hold and Bendcrete wasn't the first climbing wall manufacturer.